How do you communicate with your customers and patients? Rate yourself on a scale of 1 – 10. To some people communication is easy, others find it hard, and many are not even aware of the repercussions of poor communication. When people feel valued and engaged, they tend to be more loyal to your brand. They will be repeat customers and they’ll tell their friends to check out your shop, so you’ll be bringing in new customers too. Don’t be shy. Greet your customers when they come in. Smile. They will feel more at ease, especially if they have never been into a dispensary before. Make them feel welcome. It really only takes a smile and a self introduction. Ask questions to create connection and get them talking, they’ll be more apt to make a purchase. Do you have a website? A newsletter? It’s great to connect with your customers and followers whom you don’t see every day. Let them know what is going on at your store. In person and through your social media channels, be sure to thank your customers and patients for their business. You can ask for any feedback they might have or how you can continue to strive for service excellence. If you would like to step up your communication skills at work and in your personal relationships, you’ll want to join us June 19 & 20 for a special Communication Workshop, called Crucial Conversations. Communication skills, tops the list of fundamental skills needed to succeed in the workplace. A study was done in 2000 and years later, with the rise of social media networking and texting, communication is becoming more casual, even in situations where more formal ways of communicating are required. What this means is that people from the younger generation, may not know or even understand the importance of effective communication skills in the workplace. When you take a look at the greatest leaders, one of the traits they possess, is the ability to communicate effectively, which underscores the importance of communication skills. 1. Listen, listen, and listen. People want to know that they are being heard. Really listen to what the other person is saying, instead of formulating your response. 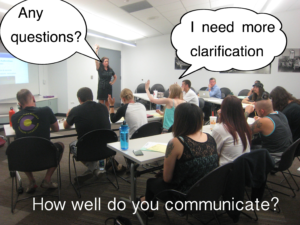 Ask for clarification to avoid misunderstandings. At that moment, the person speaking to you should be the most important person in your life. Another important point is to have one conversation at a time. This means that if you are speaking to someone on the phone, do not respond to an email, or send a text at the same time. The other person will know that he or she doesn’t have your undivided attention. 4. Check your message before you hit send. Double check what you have written, to make sure that your words are communicating the intended message. 7. Sometimes it’s better to pick up the phone. If you find that you have a lot to say, instead of sending an email, call the person instead. Email is great, although sometimes it is easier to communicate what you have to say verbally. Previous PostLab testing is cool!